Pond Boss Water Treatments This product is designed to be applied in lakes, ponds, impounded waters, wastewater lagoons, reservoirs, livestock watering systems, potable water supplies, sedimentation basins. The Block by pond boss® PRO is a blend of live bacteria and enzymes specifically designed to improve water quality by reducing unwanted nutrients. Decaying nutrients such as leaves, grass clipping, dead plants, excess food and other organic material build at the bottom of the pond in what is commonly called the "sludge" layer of the pond. The sludge layer is most often responsible for undesirable odors and low oxygen levels. 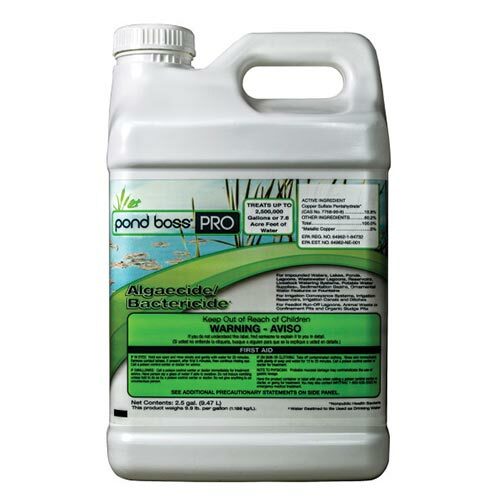 Regular use of pond boss® PRO The Block will degrade unwanted organic debris accumulation and improve the overall health of the pond while clearing the water column of unwanted organic material. This time released 5 lb. block can treat up to 5 acre-feet (1.6 million gallons)* of water over the course of 60 days. The pond boss® PRO Water Soluble Bags are a fast acting treatment. The self-dissolving bags allow easy application for an ideal start-up treatment. Its super concentrated formula is enhanced with a food source to jump-start biological action. The quick release formula helps improve oxygen levels, eliminate odors, reduce high nutrient loads and increase water clarity. One 8 oz. bag treats up to 1 acre-foot (325,000 gallons) of water*. For optimal results, use the soluble bags with The Block every 60 days to reduce maintenance costs.